Svādhyāya means study, study of these Vedic literatures. Without any guidance, if you... Just like so many ladies and gentlemen, they purchase books from the market. They have heard that Bhagavad-gītā is very nice book. So svādhyāya. 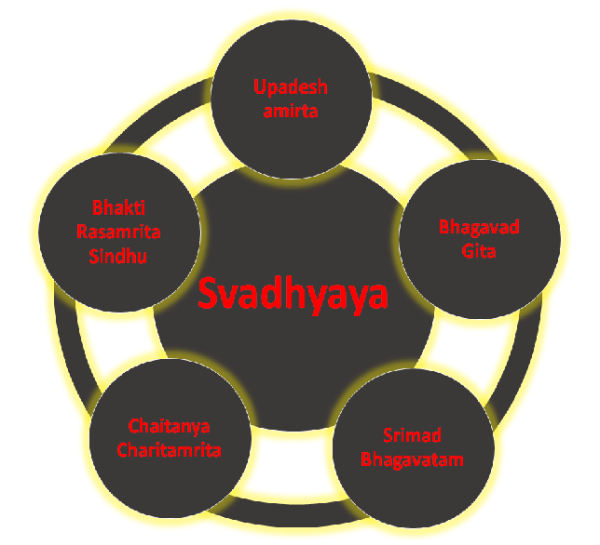 Svādhyāya means studying the vedic scriptures for the cultivation of spiritual knowledge. One should not partially study a book just to pose oneself as a great scholar by being able to refer to scriptures. In our Kṛṣṇa consciousness movement, we have therefore limited our study of Vedic literatures to Upadeshamrita, Bhagavad-gītā, Śrīmad-Bhāgavatam, Caitanya-caritāmṛta and Bhakti-rasāmṛta-sindhu. They are adequate for the understanding of the philosophy and the spreading of missionary activities all over the world. If one studies a particular book, he must do so thoroughly. That is the principle. By thoroughly studying a limited number of books, one can understand the philosophy. “Those miscreants who are grossly foolish, lowest among mankind, whose knowledge is stolen by illusion, and who partake of the atheistic nature of demons, do not surrender unto Me.” Āsuraṁ bhāvam refers to not accepting the existence of God or the transcendental instructions of the Personality of Godhead. Bhagavad-gītā clearly consists of transcendental instructions imparted directly by the Supreme Personality of Godhead. But asuras, instead of accepting these instructions directly, make commentaries according to their own whimsical ways and mislead everyone, without profit even for themselves. One should therefore be very careful of demoniac, godless persons. According to the words of Lord Kṛṣṇa, even if a godless demon is very well educated, he must be considered a mūḍha, narādhama and māyayāpahṛta jñāna. 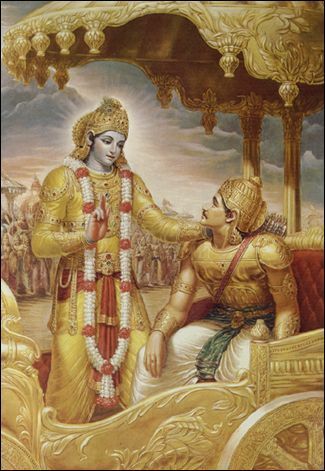 As stated in the Brahma-saṁhitā (5.33): vedeṣu durlabham adurlabham ātma-bhaktau. One cannot understandKṛṣṇa simply by reading Vedic literature. Although all Vedic literature is meant for understanding Kṛṣṇa, one cannot understand Kṛṣṇa without being a lover of Kṛṣṇa. Therefore along with the reading of Vedic literature (svādhyāya), one must engage in devotional worship of the Deity (arcana-vidhi). Together these will enhance the devotee's transcendental understanding of devotional service. Everyone wants to achieve life's ultimate goal, but due to being absorbed in the material energy, we waste our time with sense gratification. Through the study of Vedic literatures-of which the essence is Bhagavad-gītā-one comes to Kṛṣṇa consciousness. Thus one engages in devotional service, called abhidheya. When actually developed, love of Godhead is called prayojana, the living entity's ultimate goal. When one becomes fully Kṛṣṇa conscious, he has attained the perfection of life.